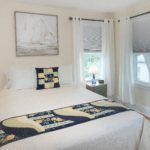 Wickham-Prince Bed & Breakfast offers you a marvelous and unforgettable view into North Fork Long Island life. We are within walking distance of Southold hamlet, harbor and beaches, and there are endless outdoor trails to be hiked or biked, antiques to be discovered, and wine and beer to be sampled. Small and quaint, our charming B&B provides exceptional service and two welcoming guest rooms. We emphasize premium amenities, including embroidered sheets, free wireless internet and a private outdoor patio to call your own. Our highly reviewed, freshly prepared hot breakfast includes homemade baked goods, fruit, and a main course tailored to your tastes. We are always available and are here to make sure your stay is memorable and comfortable. The Wickham-Prince B&B is looking forward to seeing you.